We invite you to explore India - the Land with infinite beauty ! Whether you soar high into Himalayas or peer under the ruins of the Ancient monuments dotting the landscape of India, you will cherish the experience long after your visit ! 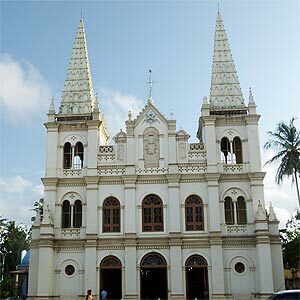 This India Travel Guide on Santa Cruz Basilica Cochin is free from any commercial interest! This site is dedicated to promote India - the vast subcontinent, its glorious past, magnificent landscape and its infinite variety. Santa Cruz Cathedral Basilica, the heritage monument and the pride of Kochi (Cochin), is amongst the oldest churches in India. Located in Kochi, Kerala, the cathedral is 500 years old and completed its five centuries of existence in 2004. It is also one of the 20 basilicas in the country. The church was built by the first Portuguese viceroy, Francesco de Almeida, when he arrived in Kochi way back in 1505. The foundation stone of this church was laid on 3 May of the same year during the feast of the 'Invention of the Holy Cross'. Upon completion, it was christened as Santa Cruz Cathedral. The Portuguese built the church initially using stone and mortar after they received permission from the King of Cochin. This didn't happen by chance. The Kingdom of Cochin had an internecine war with the Zamorin of Calicut during 1500. The brilliant Portugese Commander Afonso de Albuquerque who established the Portugese Colonial Empire in India, defeated the Zamorin of Calicut and helped stabilize the kingdom of Cochin from local marauders. As a token of gratitude, the King of Cochin allowed the Portugese to build the edifice which later became the basilica as we know today. Afonso De Albuquerque was a great military strategist who built forts and fortifications as a means to protect his base, established the Fort Kochi adjacent to this Cathedral. This was one of the few Catholic establishments that did not suffer under the Dutch in 1663. They used the cathedral as an armoury. However, in 1795, during the British rule the entire Cathedral was shattered and what remained was an elaborate granite pillar of the cathedral. The pillar is still kept in the south-eastern corner of the present Basilica. In 1887, Bishop Dom Joao Gomes Ferreira, the then prelate of Cochin, took the initiative to rebuild the cathedral. However, it was only during the reign of his successor, Dom Mateus Oliveira Xavier that the restoration could be done. In November 19, 1905, Dom Sebastiao Jose Pereira, the Bishop of Damao, sanctified the new cathedral. The Santa Cruz cathedral was elavated as a basilica on 19th December 1984 by Pope John Paul II through an ecclesiastical order. Santa Cruz minor Basilica serves as the cathedral of the Cochin Diocese - one of the oldest dioceses in India. Built on an Indo-European and Gothic style, the cathedral has an impressive pulpit and wood panelling accompanied by magnificent Italian paintings of Last Supper and Jesus on the Cross. Don't miss the pastel interiors that are mostly Gothic in style. You will find frescoes and murals depicting the death of Christ on the Cross. Sundays - 5.30 a.m, 6.45 a.m, 8.00 a.m, 9.15 a.m, 4.30 p.m.( English). Weekdays - 6.00 a.m, 7.00 a.m, 6.00 p.m.
Novena to Our Mother of Perpetual Help on Saturdays at 5.45 p.m.
Kochi is well connected by air, rail and road. The nearest railway station is Ernakulam Junction. Lot of buses ply to Fort Kochi from Ernakulam town, The distance from Nedumbassery would be 50 Kms. and from Ernakulam is 10 Kms. The nearest airport is Nedumbassery airport of Kochi.